Farmers who have a hard-to-farm wet spot on their land may be able to turn it into a well-drained, profitable field by providing a temporary wet habitat for migrating birds. 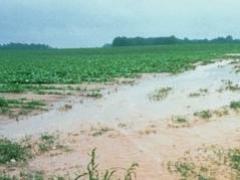 According to University of Illinois ornithologist Michael Ward, about 60 fields in East Central Illinois that qualify would receive incentives to install water control structures into existing tile drainage systems. Drainage water management, as it’s commonly referred to, would give farmers greater control over the amount of water on their land and could be used to provide wet spots until April for migrating birds. “There are no out-of-pocket costs for farmers and we will actually pay you to keep water in your field a few weeks longer,” Ward said. The program, being offered through the USDA and the Illinois Department of Natural Resources, aims to kill two birds with one stone, so to speak. The newly installed drainage water management structure will allow farmers to retain moisture in their fields that can be used by crops during dry periods, help reduce nitrogen runoff, and keep fields wet a few weeks longer to give migrating birds the habitat they need to refuel for the rest of their trip. Landowners who would like to apply for this shorebirds conservation program should contact Mike Ward at mpward [at] illinois [dot] edu. “Our research shows how current farming practices are not necessarily incompatible with providing wet field habitats for migrating shorebirds,” said Kirk Stodola, avian ecologist with the Illinois Natural History Survey. He and other colleagues of Mike Ward have been collecting data on the migration of American golden-plovers through central Illinois for years. “The exact dates of the plovers arrival varies slightly from year to year, but typically lasts 3 to 4 weeks. During this period, the birds utilize wet areas to build up fat reserves and grow new feathers. However, right now most of the shorebird and waterfowl species do not have access to this type of habitat during their stopover in East Central Illinois,” Stodola said. He added that based on the information they have collected, it’s possible for farmers to use drainage water management to provide needed wet areas in their fields, while still allowing them time to drain their fields for planting crops. What happens if we lose the golden-plover to extinction? Ward said that it’s hard to predict what effect it might have on the environment.